It’s finally here! My favorite time of year! No, it’s not Christmas time yet, it’s FALL FISHING! So, you’re probably wondering what makes Fall fishing so awesome, what we can catch, and why we love it so much here in the Tampa Bay area. Well, I’m gonna tell you right now! Why is fall fishing so awesome in the Tampa bay area? Well, for starters, by this time of year, I’m tired of being hot and sweaty out there on the boat. Yes, I love Summertime and the amazing tarpon fishing that comes with it but I’m ready to cool off a bit. October is when the milder weather here starts to kick in. That flats, the beaches, the bays, and the nearshore wrecks and reefs come alive. Baitfish will be everywhere, migratory fish will be making their way through here as they head south for the winter, and our resident fish will be trying to fatten up for the winter. That means we’ll be catching a lot of hungry fish — a lot of fish! What’s coming up and what can we catch? The truth is, just about every species of fish that lives here year ‘round and every fish that migrates near the coast in the Gulf of Mexico will be available during the fall. Here’s a list of the fish that we will have opportunities to catch. What will some of the top targets be, what will they be doing, and how do we target them this fall? Redfish will begin to school up in tighter groups on the flats and larger fish will work their way inshore to prepare to spawn. Live scaled sardines will still be available and they will be the bait of choice. Snook will move off the beaches and begin working their way back to their winter haunts. Start looking at creek mouths, river mouths, oyster bars, and other transition spots between the beaches and backwaters. Again, scaled sardines will still be the preferred bait. Chum up the area with live bait on outgoing tides. Cast your bait out and hold on! Trout will become a much larger focus than they were in the summer. The larger fish will make their way back inshore after spending the summer offshore. You will be able to find them anywhere from the beaches all the way back into the creeks and rivers. My favorite way to fish for them is with artificial lures such as jigs and topwater plugs. Cobia will come inshore and start following stingrays on the flats. Nothing in shallow water fights better or tastes better than cobia in my opinion. Look for stingrays while you are running around. If you spot a big one, turn around and see if it has a cobia on its back. If it does, have a rod rigged up with a jig and soft plastic eel. Pitch it out and work it fast. Don’t miss your chance to go fall fishing! Capt. 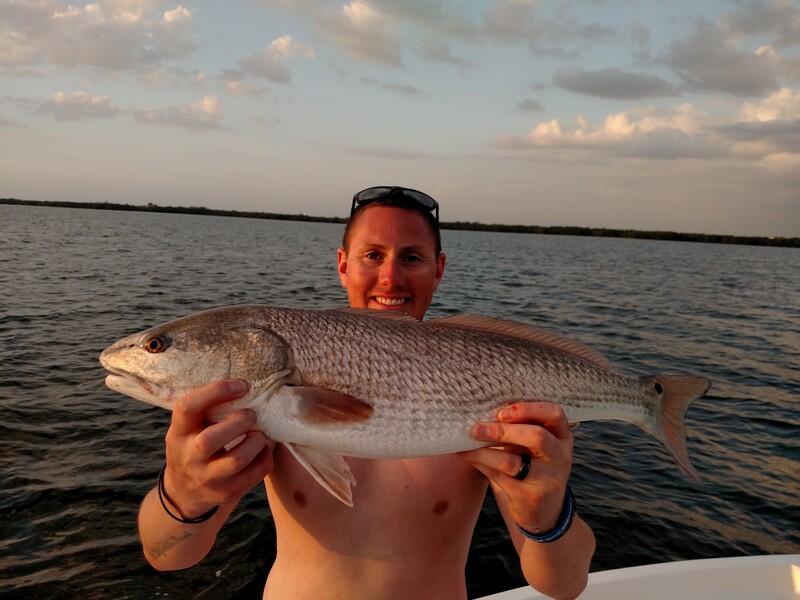 Jason is a full time fishing guide in the Tampa Bay area and specializes in light tackle, shallow water fishing. If you would like to book a trip, give him a call today.